Not surprising at all. Simon Sinek has been preaching this message for quite a while now. And I say often that for Agile to work on a product there must be at least one person who cares about it – otherwise the whole thing degenerates into typical corporate game of renouncing any responsibility. When everyone cares the sky is the limit. Wow! I would really like to use that as a manifesto at my workplace. Should we call it something special? It is much more easy to explain to an organisation than the Agile manifesto. Oh, to have been in that room…. These are the same principles I’ve been espousing in my engagements, and even as an employee and manager in years past. I love how succinct the ‘message’ is though – well done! The trick is to help individuals and companies embrace this, instead of fighting against it. I’ve been working on something around ‘beyond agile’, focusing on the behind-the-scenes-important-stuff that needs to be in place and working for things to work great. I keep coming back to human connection – that’s really what it’s all about. I have a doubt about the point 3: the “Teams” term includes the Product Owner or alike? Because as far as I know, what to build is based on Product Owner decisions and his arragement of the Backlog, even if he can listen to all the stakeholders. Apart from that, I doubt that it will be the Team, even counting on the PO, which decides what to build next. Business stuff should be the people that knows what must be built, based on business value, etc. Business stuff should be the people that knows what must be built, based on business value, etc. Hm. That would be a first.. Indeed would it not be nice if the PO or ‘business people’ could just tell us developers what they want, or maybe even what the END USER wants, or maybe even what the end user NEEDS but doesn’t know she wants. Sorry to break this to you all: it’s not gonna happen. 🙂 Not without ‘immediate and direct feedback from the use of their work’, ideally based on hard facts. It’s not so difficult to create organisation like that from scratch. But what about organisations which already exists? 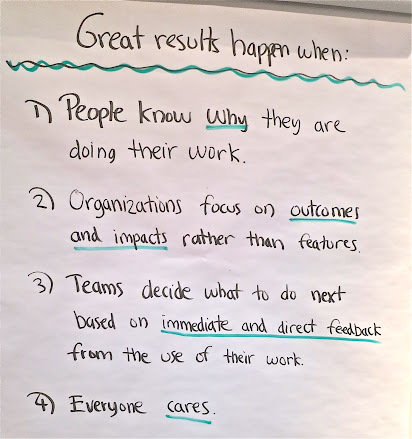 Especially point 4) “Everyone cares” could be difficult to achieve without firing people. Not ever a flamer before but this ‘core’ set of principles is so abstracted up into the ephemeral as to be of little practical use. Does anyone else see that? Take note, I say that the principles are 100% correct, but the distillation process has rendered them the Emperors New Clothes. The community that will lap this stuff up needs less philosophical and more tangible advice in my honest and frank opinion. Before retaliating, please read the title. ‘How to build the right thing’ sets this up as a recipe to do just that but the reality is that if you are good enough to act on these points in an org that doesn’t already do them, these points are stuff you already know, in different words and its even more likely that you are somewhere on the sliding scale of greatness where you know the importance of all of this stuff, and can get there with only half. What did you meen with “everyone cares”. Who is everyone? The team and it’s surroundings? And what do you mean by cares? Cares for the success of the product? So simple, yet so difficult. An old saying goes something like : “It is complicated to make something simple and it is simple to make something complicated.”. I suspect this is applicable to all things we humans do. I love the fight against it. Keep it up! 1) I know a lot of people who would contest that statement. 2) I know a lot of people who would contest that statement aswell. 3) I thought Agile was meant to solve that. See my comment 1 and 2. I agree it’s not quite that simple as that agile _solved_ the problem of ‘building the thing RIGHT’. I also agree that agile claimed also to solve the ‘building the RIGHT thing’ problem, but many agile teams are struggling to do it. I personally think the above principles are at least more specific and concrete than ‘Individuals and Interactions over process and tools’, etc. Time will tell if they provide better guidance. Maybe I’m jaded, but I’m with Carl here. I don’t see anything new here that we didn’t already know. I would have hoped for more and better guidance on getting there, i.e., the journey is the hard part, these goals are great, but non-actionable. What does this say needs to be done In a dysfunctional organization, where middle management is focused on setting (unreasonable) dates, the environment is low- or no-trust, and top management is disconnected from what’s happening? there are many practical techniques that will help you get there, such as lean canvas, feature injection, real options, impact mapping and so on. The message was intentionally abstract to try to convey the principles behind all those ideas. I’m not sure to understand how you can focus more on impacts than feature. I understand than the main indicator shouldn’t be the velocity (or something like that) but more some indicators of success defined with a lean canvas (or something like that). Am I right ?